Javid is one of the most prominent representatives of romantism which appeared in 20th century Azerbaijan literature. Javid is a founder of the genre drama written in verse. 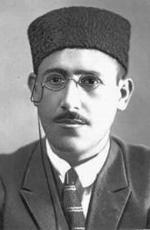 Huseyn Abdulla oglu Resizade was born in 1880 in Nakhchivan. "Javid" is his pseudonym and meaning in the Persian is Eternal . He completed his elementary education at a religious school in 1898. In 1898, Javid pursued his mid-school education in the Maktab-i Tarbiya of Mashadi Taghi Sidgi. He wrote Lyrical, sentimental and philosophical poems with Javid pseudonym. in 1909, Javid worked as a teacher in Nakhchivan, Ganja and Tiflis. He started his activity with the poems ``Gulchin`` and ``Salik``in 1898. His first stage play was staged in Bam ( Iran), in 1920 and later in Ashgabad. Javid was arrested in 1937. . The Soviet government exiled Huseyn Javid to the Far East where he died on 5 December 1941 in the city of Irkutsk. His repatriation came only in 1982. His remains were moved from Irkutsk back to his homeland of Nakhchivan and reburied in a mausoleum built in Javids honor. According to some sources his first drama play is "Balaxanı yollarında". But the same work is not in the hand, therefore it is difficult to say exact ``Ana`` is the first or "Balaxanı yollarında" is the first play. Therefore "Ana" work if the first drama written in Azeri. He completed this work in 1910. Theme of the work has been received from the Daghistan life. For the first time "Ana" dramatic play has been printed in Tiflis , 1913. The tragedy of ``Maral`` has been completed in 1912. in 1917 has been printed in Baku in the book form. His later work is `` Sheikh Sanan``. Tragedy has been completed in 1914. Work has been written in the genre of tragedy of lyrical dramatic love. The book has been printed in the printing-house of the newspaper of "Açıq söz" In the form of separate book. After 1956, they slowly began publishing his works and they staged his play, "Sheikh Sanan." She completed ``Sheida`` during 1911-1912. His most famous creation, Iblis ("The Satan") written in 1918. "Iblis" is a strong philosophical play, which explores the possibility that the devil exists within human being. Such a devil is the worst enemy of humanity. While he was a student in Istanbul he wrote ``Afet`` dramatic tragedy. Javid authored a number of historical epics, such as ``Peyghambar`` , ``Topal Teymur`` , ``Sayavush`` and ``Khayyam``. ``Peyghambar`` was written in 1922. His books were published between 1913 and 1934. "The Past Days" ("Kechmish Gunlar") came out in 1913. "Spring Dews" ("Bahar Qayghilari") was published in 1917. "Maral," "Precipice" ("Ujurum") and "Topal Teymur" were printed in 1926. This four-volume collection was last published in 1982 but has a lot of shortcomings. The plays of Huseyn Javid ``The Satan``, ``Knyaz``, ``Seyavush``, `` Khayyam`` and ``Peyghambar`` were put on stage more than onec. Notable actors of Azerbaijan theatre had created unforgettable characters in these peformances.